One of the aims of the project is to improve river corridors and lakeside habitats for bats, as well as for birds and otters. Eight of the seventeen breeding species of bat are found in the Crake valley: Common pipistrelle, Soprano pipistrelle, Brandt’s, Whiskered, Natterer’s, Noctule, Daubenton’s and Brown long-eared. Earlier in the year a few bat boxes were made and put up around the catchment and as last year’s bat walk was so popular we decided to host another one this year. Rich Flight, a local ecologist and a member of South Cumbria Bat Group, very kindly agreed to lead the walk and Water Park Lakeland Adventure Centre were happy to play hosts again. Water Park has bats roosting within their grounds and buildings so you’re (almost) guaranteed to spot at least one if conditions are right, ie. not raining or blowing a gale! Rich gave us a very informative insight into the world of bats, what they eat, how they detect their food using echo-location. Pipistrelles for example, eat around 3,000 insects a night. As dusk approached we saw our first bats – pipistrelles emerging from the roof of the main house. Armed with bat detectors we tuned into their echo-location frequency, the clicks clearly audible. 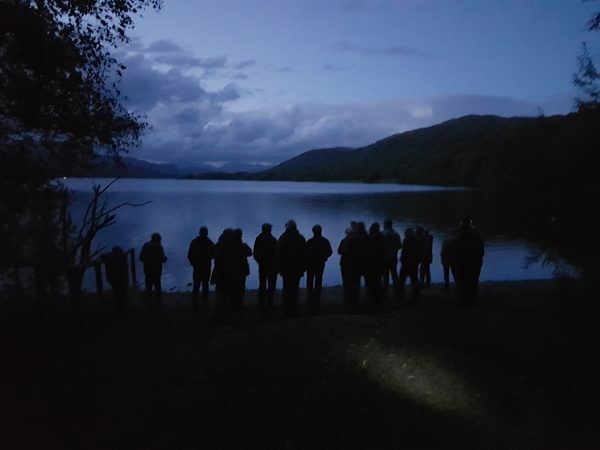 We walked around the grounds and to the lake shore where we were treated to seeing and hearing Daubenton’s swooping over Coniston Water under a starry sky. It was a brilliant evening! Many thanks to Rich, Chris Harvey from Water Park and all those who attended. Same again next year?